This West Coast boat builder stays busy creating high quality fireboats for a diverse set of demanding, multi-missioned first responders. For Moose customer satisfaction is the name of the game. This year, they’ve got that box checked. 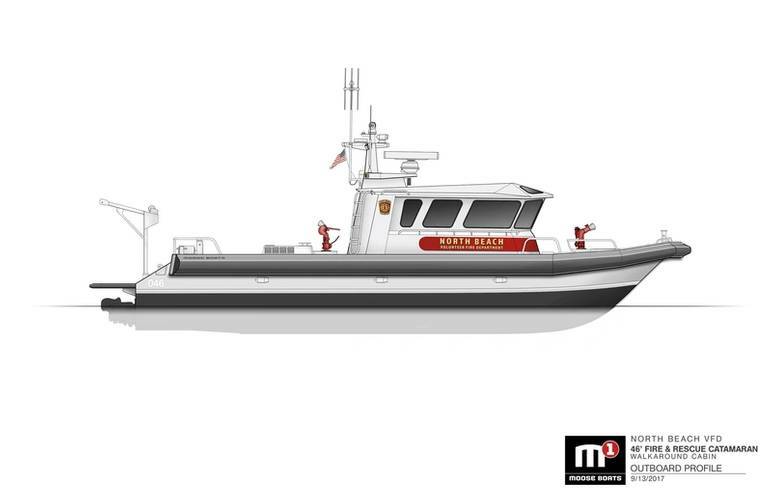 Vallejo,CA-based Moose Boats builds aluminum catamaran and monohull vessels designed to meet a variety of mission-specific applications for military, law enforcement, emergency response, firefighting and security patrol purposes. It’s been a busy year for Moose, who also recently laid the keel for a 75’ catamaran crew boat for Westar Marine Services in San Francisco. But, it is fireboats that this builder is known for. And, at present, it would not be an exaggeration to say that fireboats are ‘hot’ for Moose Boats. The firm has built and/or delivered no less than three fireboats in this calendar year; all of which are chronicled in this entry. Another law enforcement platform, which went straight to the head of the class in our GREAT WORKBOATS feature, can be seen on page 32 of the MarineNews December print edition. Operating on the site of the old Mare Island Naval Shipyard, with expanded facilities and easy access to deep water, Moose Boats has expanded its capabilities and its output is widely known for its durability, sensible design, and attention to detail. Although the firm has its standard layouts and hull forms, each boat is custom built to the needs of the customer, with every detail geared towards the boat’s final mission. And, when it comes to municipal first responders, they like to cram as many capabilities onto one hull as is possible. Within this piece, we’ll outline the best of three different recent deliveries. North Beach chose the Moose Boats M1-46 Fire Rescue Catamaran for their many needs. And those needs are plenty. The new vessel will be based in Chesapeake Beach, Maryland and serve as a search and rescue and fire suppression vessel for the Chesapeake Bay. Three forward facing shock-mitigating seats will support the crew while a full length patient care bench, a crew bench seat and head enclosure will occupy the aft end of the large walk-around cabin. Firefighting foam will be stored in the aft deck box and hose storage will be in forward deck lockers. The M1’s air-draft will be reduced to allow North Beach VFD to transit the many low clearance bridges in their area of responsibility. In a nutshell, the M1-46 has the ideal balance of heavy weather capabilities, shallow draft, maneuverability and fire suppression capacity to fulfill North Beach VFD’s wide range of response scenarios. Special features include Foredeck and Gunwale Fire Monitors, Foredeck 5” Diameter Hydrant Supply and 2.5” Diameter Discharges, Dedicated Fire Hose Storage, Firefighting Foam Storage, an 84” Patient Bench, EMS Equipment Storage, Breathing Apparatus Air Distribution System, Recovery Davit, Deployable Life Rafts, Combination Roof Bow and a Stern Ladder. North Beach expects to take delivery in early 2019. 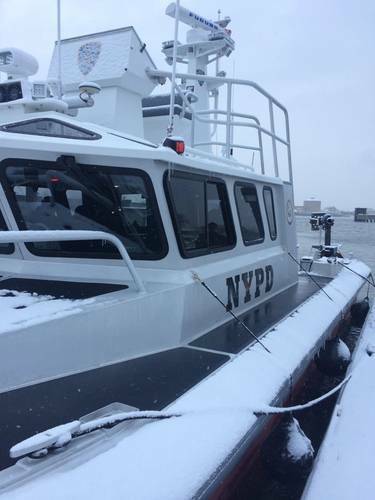 Staying competitive in terms of both price and quality, even east of the Mississippi River, Moose’s third delivery to the East Coast comes in the form of the City of Memphis’ new Moose Boat M2-28 Catamaran, which will be primarily used as a patrol boat for the Police Department’s full time Harbor Patrol unit. 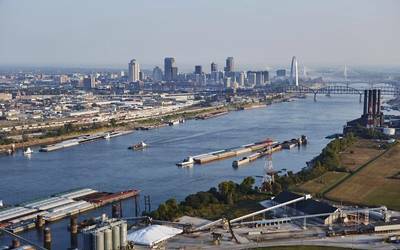 Underscoring its multi-missioned capabilities and intended role, it will also serve as a shared asset with Memphis Fire Department providing search and rescue and fire suppression duties in the treacherous Mississippi River and its tributaries. The shallow draft, stability, maneuverability and functional deck layout made the M2 Catamaran an obvious choice for the City of Memphis allowing them to fulfill all of the requirements of the vessel’s multi-mission role without compromise to its daily patrol duties. 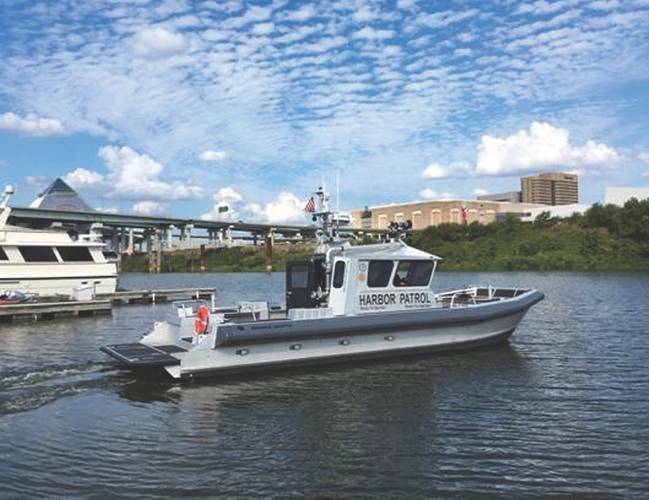 The City of Memphis Harbor Patrol also works closely with the local U.S. Coast Guard Sector, making the new Moose Boat a valuable regional asset. Heading west once again to Moose’s very backyard, San Francisco Fire Department’s new M2-28 Catamaran is another variant of Moose Boats’ proven fire rescue platform with a primary focus on dive operations and search and rescue. In addition to diver deployment, the vessel is equipped for open-water fire suppression, emergency hydrant supply for the City of San Francisco, open-water, cliff and beach rescue and Homeland Security specific duties within San Francisco Bay and beyond the Golden Gate Bridge. Supporting all those missions are myriad special features which include Dedicated Dive Equipment and Fire Hose Storage, a Custom Dive/Rescue Platform, Breathing Apparatus Air Distribution, a Search and Rescue Observation Tower, Heavy Duty Push Knee, Recovery Davit, a Beach Access Ladder and a Deck Shower. Due to the Moose Boat’s Homeland Security role, it will also be equipped with a Hale fire pump flowing in excess of 1,500 gallons per minute of fire suppression water, radiation detection equipment and CBRN positive pressure cabin filtration. A heavy-duty push knee will enable the M2-38 to come in contact with larger vessels and San Francisco’s many piers. Over a very short period of time, Moose Boats has constructed vessels for some of the most prestigious fire departments throughout the United States, including the Richmond Fire Department, Tiburon Fire Protection District, San Francisco Airport (SFO) Fire Department and Humboldt Bay Harbor Recreation and Conservation District in California, Old Saybrook Fire Department in Connecticut, Lewes Fire Department in Delaware, Anne Arundel County in Maryland, MASSPORT Fire Rescue at Boston Logan Airport, Sandwich Fire Rescue and New Bedford Fire Department in Massachusetts, Northport Fire Department in New York, New Jersey State Police, North Kingstown Fire Rescue in Rhode Island, West Pierce Fire Rescue and Bellingham Fire in Washington. This article first appeared in the December 2018 print edition of MarineNews magaine.